In the 1957 Mille Miglia Austin Healey entered a 100-Six BN4 with the new 6-port head, HD6 carburettors, a standard 2639cc blueprinted engine and the "optional" four wheel disc brakes. The car was driven by Tommy Wisdom and Cecil Winby, who brought it home to first place in its price class at an average speed of 75.9 mph. They were 37th overall in a field of over 350 cars. 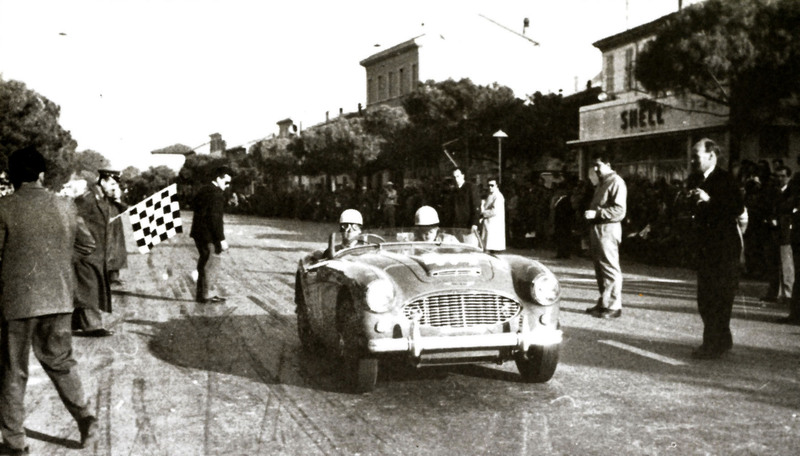 This was the fastest Mille Miglia time for a Healey with the exception of Abecassis. This car was UOC 741 which was also the car tested later in the year by Dennis May for Sports Car Illustrated and the car that pioneered Austin-Healey's entry into the rallying world. It's for this reason that the 6-port 100 Six has the Mille Miglia association, something the 3,000's never had as the 1957 event was the last of its kind. During the race the Marquis de Portago crashed his Ferrarri into spectators with fatal results and it was never held again. The first race resulted in a 1-2-3 for OM cars built in Brescia. Over the years there were many great races featuring Bugattis, Alfa Romeos, Mercedes, Maseratis and Ferraris driven by famous names such as Nuvolari, Carraciola, Fangio and Moss. One of the most famous races was in 1955 when Mercedes entered a team of 300 SL's driven by Fangio, Moss, Kling and Herman. Moss was partnered by journalist, Dennis Jenkinson. They devised a system which involved mapping the entire circuit and recording the information on an 18 foot roll of paper from which "Jenks" read instructions during the race. Following tradition they left at 7.22 am in the now famous, number 722, 300 SL. 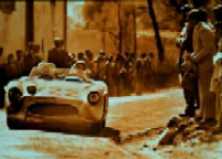 They reached speeds in excess of 170 mph on dusty public roads lined on both sides with enthusiastic Italian spectators, conditions unthinkable in todays era of armco and run off areas. They won the race in 10 hours 7 minutes and 48 seconds setting a new average speed record nearly 10 mph better than the old one. Donald Healey entered his first Mille Miglia in 1948, finishing 9th overall and first British car, driving his Healey Westland. 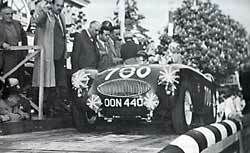 He competed again in 1949 in a Healey Elliot the same year son Geoff won the touring category in the roadster. 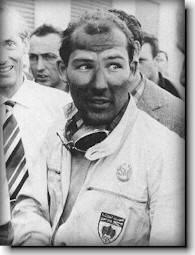 He also competed in 1950, 1951 and 1952 in Nash-Healeys and in the 1955 race in a 100S, (OON 439), recalling Stirling Moss waving to him as he flashed by on his way to victory. In a 1978 interview with Road and Track , Healey summed up the race. "I drove the whole 1,000 miles. It was quite a thing to experience...to literally be able to kill cats, dogs and even people...how awful... but with total freedom of the road. Lunatic race of course. You went through city streets that had streetcars and buses going down the centre of the road and you were obliged to cut people aside a bit!" 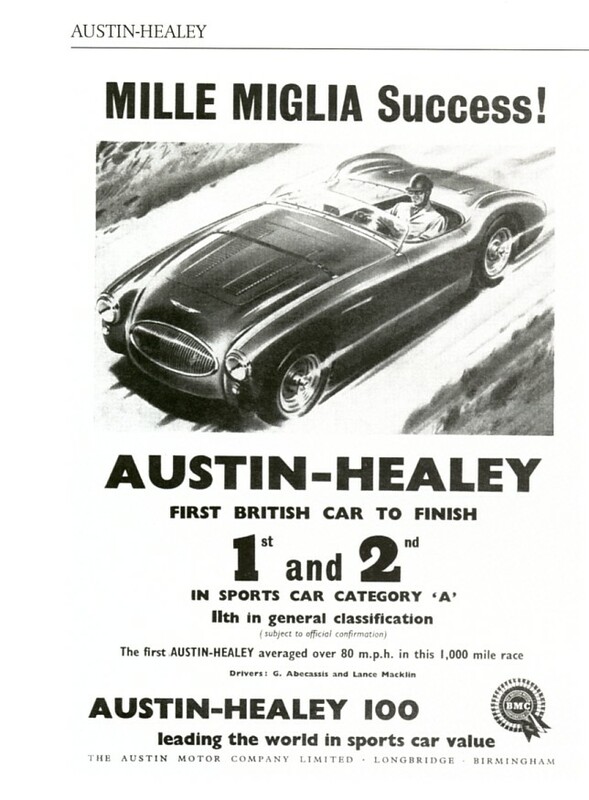 Austin-Healey 100's competed in their first year of production in 1953 with two cars being entered. Both retired although one made it within 16 miles of the finish. In 1954 three 100S's were entered, again without much success. two retired whilst Macklin finished 23rd overall in his car. With a top speed of about 130 mph they were of course no match for the Ferraris, Maseratis and Mercedes. 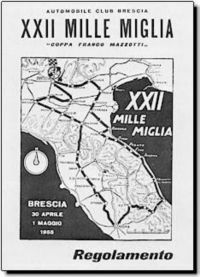 The Mille Miglia was a spectacular Italian road race for sports cars run over a 1000 mile course, on public roads from Brescia to Rome and back again. 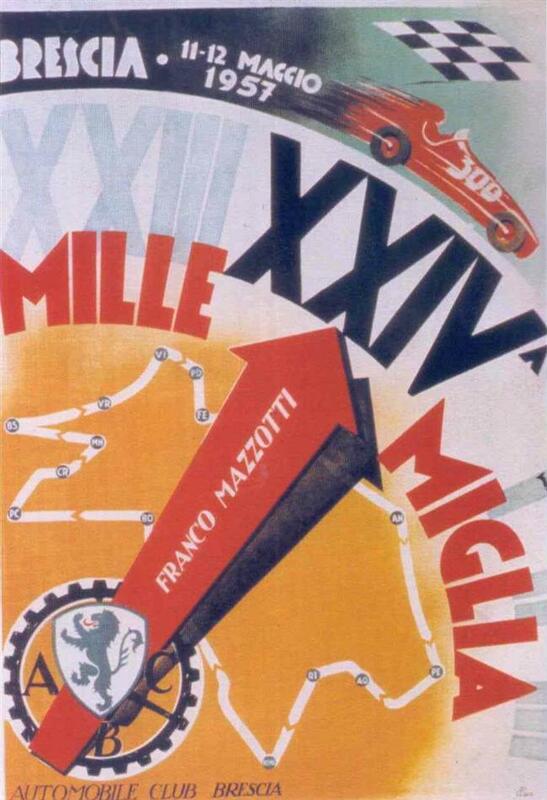 The race was the idea of Aymo Maggi of the Auto Club di Brescia and the first race was held in 1927. Tactics were simple, drive as fast as you can. Cars left at one minute intervals, the slower ones first. The car's numbers depicted their start times.